From left to right, Josh Carpenter with the City of Birmingham; Lee Smith of BBVA Compass and the Birmingham Business Alliance; Brantley Fry of Sen. Doug Jones' (D-AL) office; Center Point, AL Mayor Tom Henderson; Alabama Gov. Kay Ivey; Jefferson County Commissioner Joe Knight; Autocar President James M. Johnston; Autocar Chairman Andrew Taitz; and Rep. Gary Palmer (R-AL). The plant is located in a 1 million sq. ft. complex in both Center Point and Birmingham, AL and is expected to create 746 jobs. Autocar said it has hired more than a third of that amount already and is recruiting additional team members across production, engineering, and management roles. Autocar noted it expects to invest $120 million in the Jefferson County plant, where its severe-duty ACX cab-over-engine truck model is built. In related news, the company also announced it will be the first truck manufacturer to offer Cummins' X12 12L diesel engine in the ACX and will begin taking those orders in June. Alabama Gov. 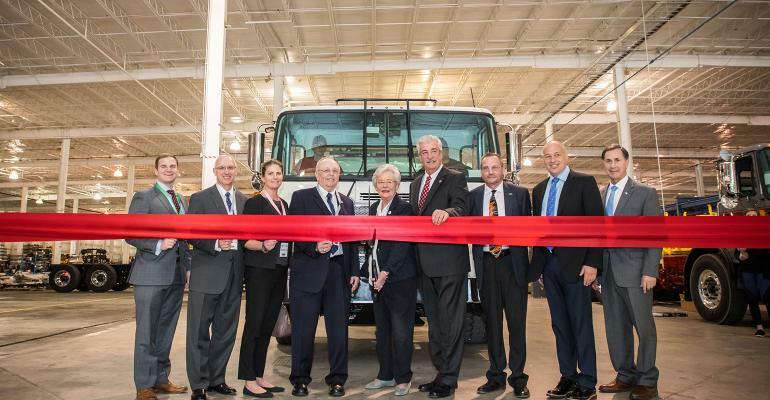 Kay Ivey, Jefferson County Commissioner Joe Knight and Center Point Mayor Tom Henderson attended the ribbon-cutting along with Autocar Chairman Andrew Taitz and President Jim Johnston. "Autocar already has a significant impact on Jefferson County and will continue to do so with this new manufacturing plant," said Gov. Ivey. "Autocar, and its expansion because of its success, is a fantastic representation of our commitment to help businesses not just survive but thrive."